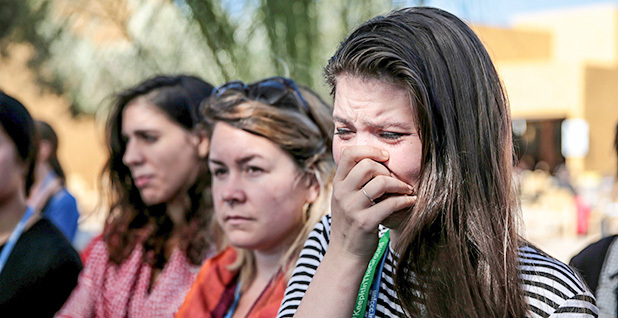 Environmental activists attending a U.N. climate change conference in Morocco break down in tears at the news of Donald Trump’s election as the 45th president of the United States. Photo courtesy of AP Images. MARRAKECH, Morocco — President-elect Donald Trump has long insisted he would pull the United States out of the Paris Agreement, but few climate experts meeting here seem willing to take him at his word. Diplomats and environmental advocates assembled for the first U.N. talks since nearly 200 nations struck a landmark climate deal in December acknowledged that the bombastic Republican's victory last week injected substantial uncertainty into the process. But as the dust settled, participants in briefing auditoriums and watering holes of this ancient city offered each other hope that Trump might not walk back U.S. climate participation after all. "We are not assuming that everything he said in the campaign will be what he does as president, because he's famous for changing his mind and reversing his position, sometimes in the same talk show," said Alden Meyer, climate strategy director for the Union of Concerned Scientists. He pointed to Trump's walk-back of a statement made during the campaign that women who have abortions deserve to be "punished." "Let's not assume he's going to act on the kinds of statements he's made in the past," said Meyer. "Let's give him a chance to evolve." A number of delegates over the weekend expressed similar hope for a change of heart from Trump. That, though, seems at odds with the incoming president's repeated promises to "cancel" or at least "renegotiate" the Paris deal that capped more than two decades of painstaking negotiations. Trump has called climate change a "hoax" perpetrated by the Chinese to place the United States at a competitive disadvantage and has pledged to withdraw all financial support for U.N. climate agencies and other climate change programs. A key transition aide told E&E News that the Trump team is in fact looking for ways to withdraw from the accord once the administration takes office (see related story). But participants in Marrakech note Trump has never held elected office and argue he is likely to be swayed by advisers with a more nuanced view of global policy. He'll be reluctant to harm U.S. clout abroad, they say, as a withdrawal from Paris surely would. And they celebrated last week's New York Times report that the real estate mogul and his children joined other business leaders in signing an advertisement in that newspaper ahead of the 2009 U.N. climate summit in Copenhagen, Denmark, urging President Obama to "strengthen and pass United States legislation, and lead the world by example." The House had cleared a cap-and-trade bill ahead of the summit that the Senate was destined never to vote on. "We need President Trump to be more like Trump the businessman and not like Trump the rabble-rousing Republican candidate on the campaign trail," said Mohamed Adow, Christian Aid's international climate lead. He called it "very encouraging" that Trump's children also signed. "As new advisers to President-elect Trump, it is good to know they, too, recognized the importance of strong action on climate action in 2009," he said. Advocates here took it as a hopeful sign when Trump emerged from Thursday's meeting with Obama saying there were some positive aspects of the president's Affordable Care Act, though a few acknowledged it was concerning when he doubled down on his campaign promise to build a wall along the U.S.-Mexico border. National delegations were very reluctant to weigh in on the new leader of the world's most powerful nation. They spoke instead of the "moral obligation" the United States still has to both limit its emissions and make good on the Obama team's promises of climate aid — including the $3 billion in funding for the United Nations' Green Climate Fund that the Obama administration has had difficulty eking out of Congress and that is virtually assured now to fall by the wayside. But Amjad Abdulla, chief negotiator for the Alliance of Small Island States, said he expected Trump to do a "great job" delivering U.S. commitments on climate change. "When it comes to developing countries, yes, the U.S. is going to show the leadership in all the global issues including climate change," said Abdulla, who represents a group that faces an existential threat from rising sea levels and has sought both steep emissions reductions and financial assistance as a matter of survival. "I'm sure they will do their fair share in the upcoming administration." Abdulla and others argued that Trump carried economically disadvantaged states on Election Day not because he promised to dismantle environmental protections but because he pledged to create economic opportunities. And he could spur economic growth more effectively through infrastructure spending, clean energy incentives and foreign climate aid than by trying to resuscitate the U.S. coal industry, they argued. If concern for the U.S. economy didn't motivate Trump to soften his climate views, zeal for its standing in the world would, many predicted. Bucking international sentiment on climate change could cost him in ways the candidate Trump might not have realized. "He's had very little contact with world leaders," said Joe Ware, a spokesman for Christian Aid. "He'll now be having weekly contact with world leaders who will all be saying to him, 'Whatever you do, don't go and screw up our planet, thanks very much.'" If he does, it won't help him win their cooperation in other areas. Abdulla reached for a sports analogy. "If, for example, I'm the leader in football, there's no way that I can pull out. It's just not going to work." 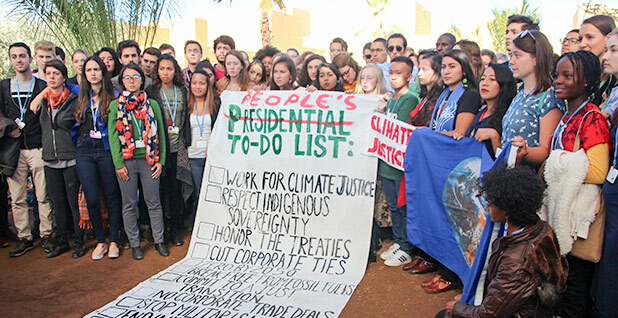 Youth activists at the U.N. climate conference in Marrakech respond to the election of Donald Trump, who has called climate change a hoax. Photo courtesy of Flickr. U.S. climate skeptics begged to differ. "The body of evidence suggests one ought to expect that any executive action on this front from the past eight years will indeed face a sincere effort at modification or reversal," said Competitive Enterprise Institute senior fellow Christopher Horner, an outspoken opponent of Obama's climate policies, in an email. Marc Morano, who publishes the climate skeptic site ClimateDepot.com, said the president-elect was not only "the most strongly skeptical" Republican president or nominee ever but unlikely to be swayed by global pressure. "Even going back to the 1980s, Trump's political philosophy was a form of 'America first' and not very supportive of international trade or similar agreements," he said. Morano has attended these summits in previous years to tell participants the United States wouldn't make good on the promises the Obama administration officials made in the negotiating rooms. He arrives in Marrakech this week for events highlighting how "Clexit," as he's termed the U.S. departure from international climate efforts, would play out. "Climate skeptics are back," Morano said in an email to E&E News. "They now control the House, Senate and ... the Presidency. Expect both international and domestic climate agenda to be reversed. It's about time!" Trump's transition team is mulling a strategy that includes departure from the Paris Agreement alone or from the broader U.N. Framework Convention on Climate Change. Leaving the underlying convention means the United States would no longer be party to Paris the following year. That would be a 180-degree shift from the current U.S. stance on climate. Indeed, Obama was credited with helping to bring last year's deal home through persistent bilateral engagement with other countries, especially China. "When the U.S. is on board, you do notice it," said Liz Gallagher, senior associate at the London-based E3G. "If you look at the diplomatic machinery that the State Department has and the fact that it oriented all that around the climate agenda, that's made a big, big impact here." But the world has been through this before, advocates note, when the George W. Bush administration walked away from the 1997 Kyoto Protocol. In fact, the last time the U.N. climate conference was held in Marrakech in 2001, it was a few months after Bush confirmed that position. That left countries the task of plotting a climate strategy that didn't include the world's largest economy. But the experience of Kyoto showed it is possible to work around the United States, negotiators said. And geopolitical shifts over the last decade and a half make it easier. "The U.S. never joined the Kyoto Protocol, and the negotiations continued. Obviously, as the largest historical emitter, we hope that they continue to embrace renewables for the economic and environmental benefits they offer. Whatever happens, the international community is determined to go on," Maldives Environment Minister Thoriq Ibrahim said in a statement. China's delegation to the talks held a briefing with reporters Friday to reaffirm that country's commitment to Paris, a move that led participants to predict the country would take up the mantle of moral leadership in this process if the United States drops it. "China's climate strategy and policy is in accordance with China's national interest, and is not dependent on the U.S. presidency," said Zou Ji, deputy director-general of China's National Center for Climate Change Strategy and International Cooperation, which has links to the government. "China has noticed the goodwill that President Obama has generated for the U.S. in recent years because of their leadership on climate change," said Jake Schmidt, international climate director at the Natural Resources Defense Council. "That dynamic won't go unnoticed in Beijing." Also Friday, Germany released its long-term decarbonization plan, which showed a steady phase-down of coal use as Trump pledges to revive it in the United States. And ministers from the High Ambition Coalition of countries including the European Union, islands and other countries, released a joint statement calling Paris a "turning point towards a more prosperous and stable world." "We'll see what happens, but I'm pretty confident that we'll get somewhere, and it feels like the mood's picked up," E3G's Gallagher said.